“Every student deserves a great teacher, not by chance, but by design” — Douglas Fisher, Nancy Frey, & John Hattie What if someone slipped you a piece of paper listing the literacy practices that ensure students demonstrate more than a year’s worth of learning for a year spent in school? Would you keep the paper or throw it away? We think you’d keep it. And that’s precisely why acclaimed educators Douglas Fisher, Nancy Frey, and John Hattie wrote Visible Learning for Literacy. They know teachers will want to apply Hattie’s head-turning synthesis of more than 15 years of research involving millions of students, which he used to identify the instructional routines that have the biggest impact on student learning. These practices are “visible” for teachers and students to see, because their purpose has been made clear, they are implemented at the right moment in a student’s learning, and their effect is tangible. Yes, the “aha” moments made visible by design. With their trademark clarity and command of the research, and dozens of classroom scenarios to make it all replicable, these authors apply Hattie’s research, and show you: How to use the right approach at the right time, so that you can more intentionally design classroom experiences that hit the surface, deep, and transfer phases of learning, and more expertly see when a student is ready to dive from surface to deep. Which routines are most effective at specific phases of learning, including word sorts, concept mapping, close reading, annotating, discussion, formative assessment, feedback, collaborative learning, reciprocal teaching, and many more. Why the 8 mind frames for teachers apply so well to curriculum planning and can inspire you to be a change agent in students’ lives—and part of a faculty that embraces the idea that visible teaching is a continual evaluation of one’s impact on student’s learning. “Teachers, it’s time we embrace the evidence, update our classrooms, and impact student learning in wildly positive ways,” say Doug, Nancy, and John. 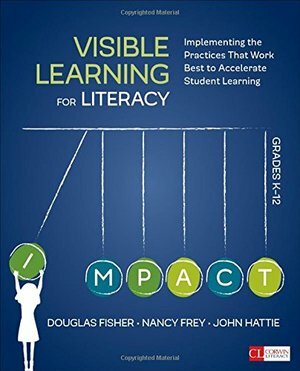 So let’s see Visible Learning for Literacy for what it is: the book that renews our teaching and reminds us of our influence, just in time.